Since Walter wasn’t available for this session, we thought this might be a wonderful opportunity for some dice-driven fantasy game. Crazed as we are for Nightmare House, Moritz did not meet with much trouble when he tried to convince us of Undead. 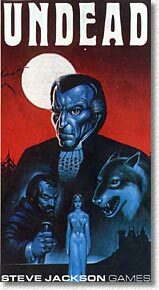 The description of Undead is breathtaking: Based on Bram Stoker’s Dracula novel (indeed, meticulously following it), this game was said to combine elements of role-playing games (Moritz took the job as neutral dungeon master, Hans acted as vampire and the rest of us formed the hunter party) and board games (board, dice). Moritz told us a lot of blood transfers, battling vampires, Sherlock Holmes and everything else that makes a romantic’s heart beating faster and faster. Hunters: "We advance versus west (etc.) and check for coffins - anything there?" Advance time chit two hours, go back to step 1 if it is before dawn. Remember, we played ten days. In all this time, we found: a) a coffin, b) some destroyed coffins (we kept wondering about those secret allies – after the game, Moritz told us that this destruction was the consequence of a die roll which indicated "coffin vandalism" – imagine Walter’s reaction on this) and c) a female vampire (which we could instantly slay, without trouble but also without consequences) – however, this vampire affaire was one of two times that the newspaper had hints for us. There were annoying game pauses for us when Moritz played through the night with Hans, and the same was true for Hans when it was our turn. Games can’t get much duller than this. After two hours, we finally stopped this. If you own a copy of this vain effort of game design, sell it on Ebay before others read this review. Granted, this may sound harsh and cynical, but this game really doesn’t deserve other. It is devoid of any virtues and deformed by dreadful design flaws. 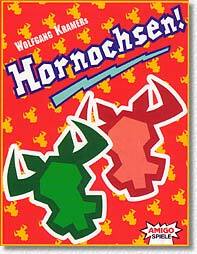 After the Undead trauma, we needed some good, ol’, German-style, down-to-earth game for our successful atonement. After some minor squabbling we agreed on "Ohne Furcht und Adel". Refer to Aaron’s review of this game. I succeeded this time in winning (perhaps the first time ever, not sure about this) by following a low-profile approach. 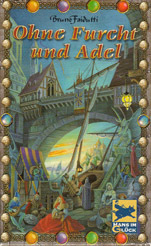 The results of this game are a further confirmation of Moritz’ theory that "Ohne Furcht und Adel" cannot be won if you ever happen to fall victim to the assassin. Moritz proposed a rule change: If you are the assassin’s victim, you won’t lose your turn, you just won’t be able to use your character’s special ability and you won’t get the extra money for matching buildings. This really might work out, because the assassin is still a powerful character: The thief can’t prey on you, and you’re the first to act (of tremendous importance in the final round if you can raise an 8th building). Westpark Gamers score: no new scoring. Hornochsen may be described as the intellectual version of "6 nimmt". The main differences are that (1) the 5th card makes you take a row of cards, (2) a card lower than the lowest row of cards is added to the highest row of cards, (3) Players have special cards (+5, x2) they can add to a row of cards, (4) Players take turns (so no simultaneous playing!) and (5) they can play either 1, 2 or 3 cards. The resulting game play is very different from "6 nimmt". 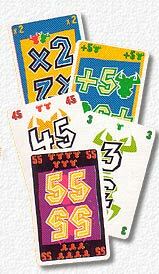 The "6 nimmt" strategy can basically described by the "höchste-niedrigste" ("highest-lowest card") approach: The card you play must fit in a row and still not be the 6th one – this can rarely be guaranteed; therefore, your card must be lower then a card one of your opponents is likely to play (otherwise you’re the hapless fellow to take the row) but high enough to make someone else take the row. Or conversely, your card must be so high that someone else takes the row before you and you can start a new row. This strategy is voided in Hornochsen since there is no simultaneous play and you can play 1-3 cards. In Hornochsen, you need cards to complete rows on your own without external interference. If you were able to get a completely green row with your +5 and your x2, this should win the game. Alas, you can play only three cards at a time so the secret is careful preparation of your winning move. Try to prepare a row in a way that no-one can complete it except you, and then play your two special cards and the final, fifth card. Of course, this actually never works out... So you have to aim at less ambitious goals, trying to secure at least one 2x. Combined with some positive points, this should win the game. There is something we have noticed: Aaron was the first to quit the game, and he won. I was second to quit, and I was second. The same is true for Moritz who quit and ranked third. Only for Günter and Hans, this was the other way round. This basically means: The longer you stay in game, the more probable it gets that you will swallow all those nasty "Hornochsen" cards (negative points, that is).